The value of our Catholic tradition is evident in every classroom and every student’s experience each day. The school community is connected to an active and supportive parish and we benefit from the ability to weave Catholic values into everyday life. The Religion program strives to help students grow in spirituality during their years at St. Lucy School. 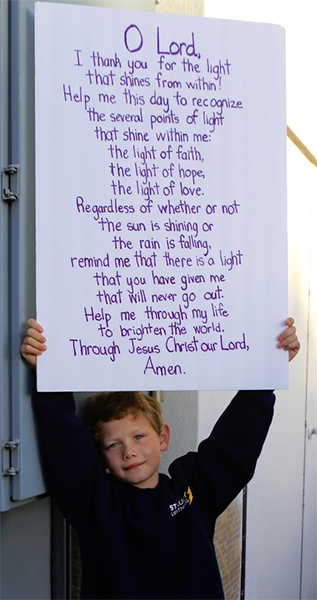 St. Lucy School students, faculty, and staff begin and end each day in prayer as a faith community, with different grades leading the prayer each morning. Religious instruction is considered a core academic subject at St. Lucy School. Using formal texts and supplemental print and web resources, religion classes emphasize family life, social justice, and Christian service. 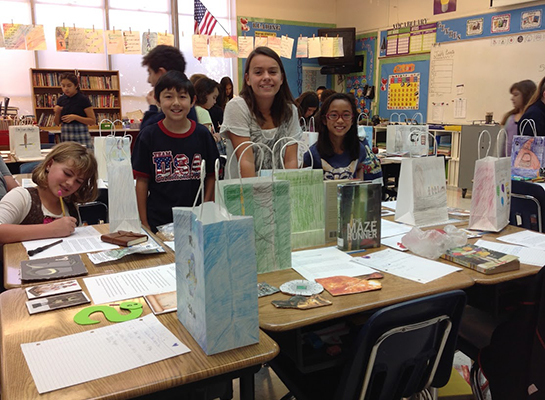 All students in K-­8 participate in service projects with Jr. High involved in Community Service Learning Projects. In all classes, Gospel values are a central theme. Non­-Catholic students are expected to learn and participate in class as an exploration of the Catholic faith. 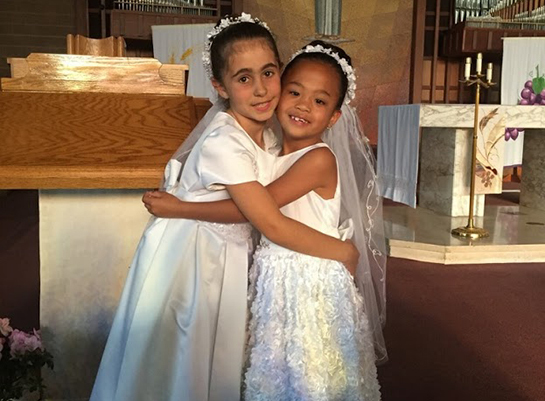 The second grade religion program prepares Catholic children to celebrate the sacraments of First Reconciliation and First Holy Communion. Catholic Students in grades three through eight participate in the sacrament of Reconciliation at Advent and Lent. Faith is at the core of preparing students for life. 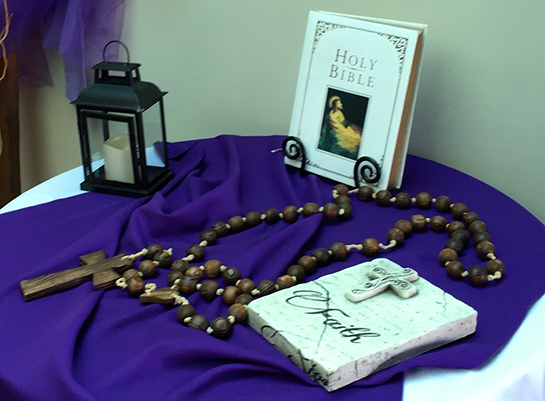 Each year, the faculty selects an annual values­ based theme with monthly focus areas, which is integrated throughout the school day to provide opportunities for student reflection and spiritual growth. The 2017-18 school theme is “Respect is Our Superpower”. Monthly focus areas will be used throughout Masses/Family Groups/Classroom Activities as follows: Trimester 1 focuses on reverence, self-discipline and integrity. Trimester 2 focuses on cooperation, positive influences and sharing personal gifts. Trimester 3 focuses on responsibility, service and problem solving. 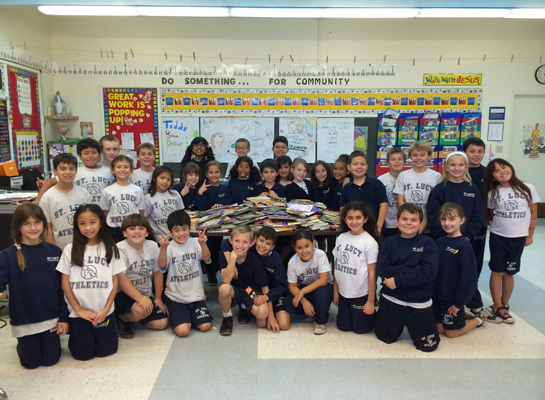 The Campus Ministry program at St. Lucy School is home to the school-­wide student service program, the Gr. 5-8 Retreat program, the Family Groups Program, and a full annual calendar of School Masses and student projects. The Director of Campus Ministry partners with the classroom teachers, school administration, and parish leadership to ensure that the yearly school theme, liturgical celebrations, Reconciliation prayer services and service projects reflect the vibrant mission of the Catholic Church. It is especially important that all students find opportunities to participate in the Campus Ministry program through planning, leadership, service, and reflection. Students look forward to lively and engaging experiences, where they focus on exploring and developing their faith and building community. Outside speakers augment special talks and activities by St. Lucy School teachers and parish leaders. The retreat program includes half-day retreats in 5th, 6th, 7th and 8th grades and a full-day retreat for 8th graders in the spring. Students participate in planning and participating in school Masses two or more times per month. The school community also recognizes and celebrates various feast days throughout the liturgical calendar. 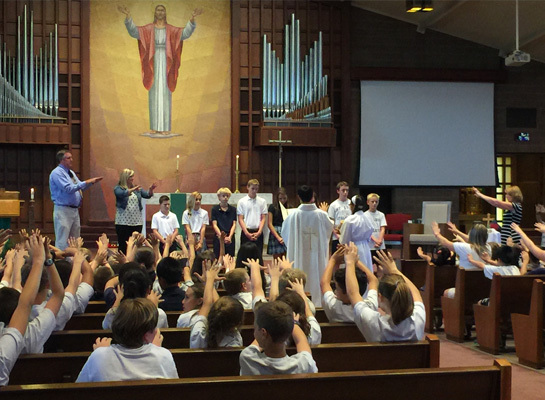 In addition to the monthly school day Masses, monthly student­ planned Family Masses are celebrated by the entire parish at specially designated 9:00 a.m. Sunday Masses. The purpose of the St. Lucy Parish School service program is to help students acquire the Gospel values of justice for others, love thy neighbor, and actively serve the Global Society. Our program includes service opportunities that provide continual challenges, are part of real ­life situations, and are well planned so that both students and teachers are fully prepared for the experience. St. Lucy School students learn through example that we are part of a greater educational, religious and social community. Students in all grades engage in age ­appropriate community service by providing special art projects to the elderly, collecting food and clothing for St. Lucy Parish Outreach and other local community organizations, supporting local and global organizations (such as Heifer International and the American Red Cross) through the Penny Challenge, and volunteering at community service organizations and centers, such as Sacred Heart Community Services. Activities are tailored for primary, intermediate, and junior high students. They include coordinating collections of needed articles, service in the school, and service to their communities. In addition, St. Lucy students sponsor three charities: Notre Dame Americorp, Presentation Sisters, and the Loving and Living Center. School-­wide Service Days take place once per trimester. During Service Days, the whole school completes acts of service. Each class is asked to complete a specific service project based on the yearly school theme that contributes to those in need in some way, and students are encouraged to think about why they are performing that particular service activity. Jr. High service is completed on or off campus in the morning before Mass. Each class, spends time reflecting on what they experienced and how they acted as Jesus would have. Ultimately, the goal is for the whole school to be involved in service. By integrating faith, knowledge, values, and community, our students learn to think critically, discover a love of learning, live the Gospel message, and reach out to others through service. Each trimester, Jr. High students undertake two new projects. After they complete their projects and reflect on what they did, they link scripture with their service essay, create a class slideshow and a special service bulletin board. This has helped students go beyond fulfilling a requirement and instead think about why we strive to model service as a way of life. 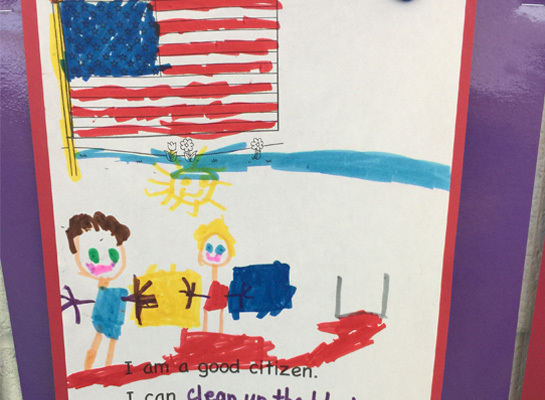 The increased insight into peer projects has encouraged students to explore different methods of giving back to others, and inspires our younger students to give back as well. Past projects for junior high students have included: volunteering for the Parish Giving Tree, SLS Bible Camp counselors, Habitat for Humanity, Toys for Tots, Corinthian House, volunteer coaching, convalescent homes, Sacred Heart Community, classroom help for specific projects, library volunteers, EDGE participation at SLS, Project Linus, environmental volunteers, altar serving, and parish choir. 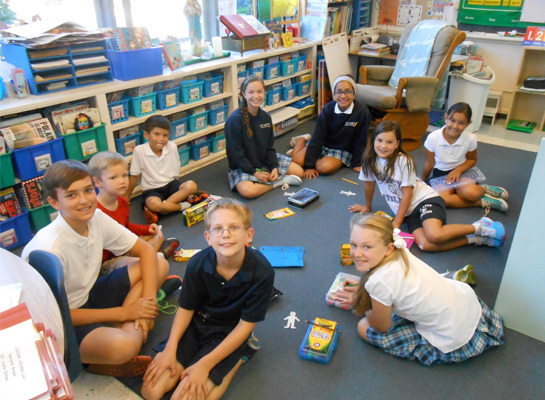 The Family Groups program is a student favorite at St. Lucy School! Each student in grades K-­8 belongs to a Family Group, which is composed of one student from each grade level, with the eighth grader serving as the “Head of the Family”. The Family Groups meet once a month, with different students taking turns leading the group in opening and closing prayers, guided reflections and questions related to the school’s monthly theme, as well as fun group religious activities. Every student at St. Lucy School is known and loved by not only classmates, but by many other friends throughout the school. Family Groups allow more opportunities for this connection across the grade levels. Our younger students feel comfortable and happy, and look up to the older students who treat them with care, kindness, and warmth. This is apparent in the school hallways, at daily morning assembly, and at special events when the students can be seen waving to and greeting each other with enthusiasm. This special connection is one of their favorite aspects of life at St. Lucy School! Students from younger grades are also paired with students from older grades. They meet monthly during class time and work on projects and activities together. The buddy program begins with fourth graders paired with kindergarten buddies and continues pairing fifth graders with first graders. We are blessed to be part of a vibrant parish! 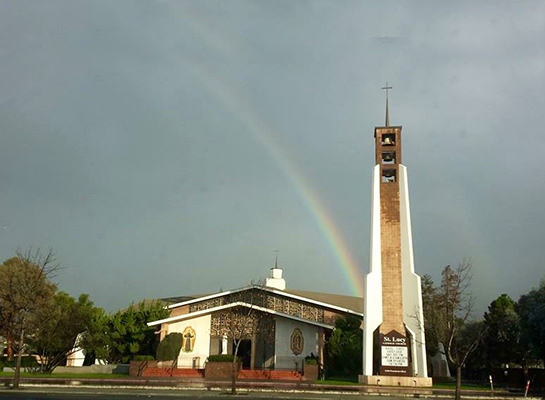 Since 1914, St. Lucy Parish has been noted for its ministry to the people of Campbell. There are many programs for worship and Christian formation of children and adults. Our parish church was blessed in 1967, replacing the former church which is now the school gymnasium and Parish hall. The PAC, a Parish building, is used for special student events, retreats, parent workshops, receptions, guest speakers, and other special events sponsored by the school. Our pastor and priests visit our classrooms often and greet students and families before and after school.